In a recent article in the New York Times Style Magazine, Bruce Pask talked about how hot Teva is at the moment. 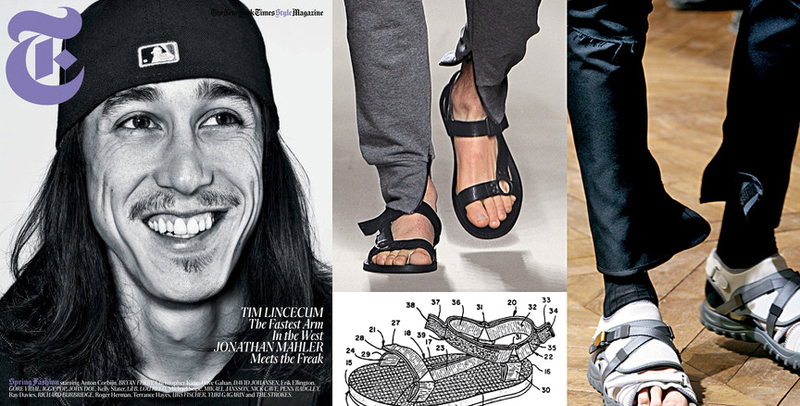 Coupled with the article were runway shots of men in sandals, one from Bottega Venta, and the other from Lanvin. That got me thinking, it’s likely more men will be displaying their feet in the spring and summer as a result of this article. But the question is are you ready for that? All winter long I’ve neglected my feet, with the exception of clipping my toenails. That can only mean one thing; my feet are rough. I knew that was the case but I was too lazy to care. After seeing this article, however, I took action and started using a pumice stone. Rinse of loosened skin and repeat on the other foot. It’s really that simple gents. And with some consistency, 2-3 times a week until they smoothen out, which equates to and extra 10 minutes per week, you’re well on your way to being sandal ready. Now, if this kind of maintenance is too much, get in the chair for a pedicure. If that’s too girly, we’re back to square one. You can keep your feet choked up all summer long or you can man up and sand ya hooves. I’ve chosen to work on mine. This entry was posted in Uncategorized and tagged Bruce Pask, Carol's Daughter, foot care products, Grooming for men, Men's grooming, Teva, Teva Sandals Men. Bookmark the permalink. Could not agree more! Smooth hooves are a must if you plan on wearing sandals. Seriously men, take care of your feet!